Dedicated to providing quality, all-access music programs to the geographically isolated, the economically challenged, and to those who need the joy of music the most! Please check back frequently as we will continue to update this page with new events, programs, and free demonstrations. Hobart, NY – On Saturday, June 8th from 1:00 to 4:00, The Community Music & Arts Network hosts a Family Fun Day Open House at the Hobart Activity Center gymnasium and Center for Music and Creative Development, located at 8 Pine Street next to the library and town park. From 1:00 to 1:30 pm, director Pamela West-Finkle and local families enrolled in her Music Together® early childhood music program will demonstrate interactive sing-a-long songs celebrating Music Together’s 25th Anniversary. This academic year (September 2012 to June 2013) marks the 25th Anniversary of Music Together®. First available to the public in 1987, Music Together pioneered the idea of research-based, developmentally appropriate early childhood music education that emphasizes and facilitates caregiver involvement in a child’s musical growth. Since then, Music Together has grown into the internationally acclaimed program it is today. Beloved by millions of families and early childhood educators, the program is now taught in 48 US states and in 40 other countries. Music Together is based on the recognition that all children are musical: they can learn to sing in tune, keep a beat, and participate in the music of their culture, provided their early environment supports such learning. Music Together is the only program of its kind that cultivates such a rich music environment. Fans include many celebrities—Chris Rock, Billy Joel, Amy Poehler, James Cameron, Cyndi Lauper, Billy Baldwin, Chynna Phillips, and Brooke Burke, among others, have enrolled their children in Music Together classes over the years. With licensed Music Together centers around the globe, the company continues to grow and now offers programs for children from birth through grade two. All classes include developmentally appropriate music and movement activities that support and respect the unique learning styles of young children. A Music Together class is an enriching, playful community of children and families sharing songs, playing instruments, chanting rhythms, and moving around in an uninhibited, relaxed, playful, non-performance-oriented setting that brings families back again and again. The award-winning songs are arrangements of original and traditional songs presented in a wide variety of tonalities, meters, and cultural styles. Following the Music Together demonstration, Pam West-Finkle will give a free children’s concert starting at 1:30 pm. “Miss Pam,” as she as known by hundreds of Catskill Mountain children, will perform songs from her Parents Choice Award winning CD, “Unicorn Crossing (www.cdbaby.com/angelpamwest). From 3:00 to 4:00 pm, families can enjoy the gymnasium, the carnival games and snacks, and the playground. Pamela West-Finkle will be available for questions and registration information in the community music center. The Community Music & Arts Network is a community music center serving the local Catskill mountain communities with music programming for all ages and ability levels. 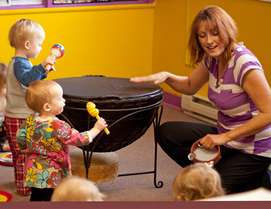 It is a licensed Music Together® center, providing early childhood music curriculum to local families and preschools. In addition, the center provides after school music programs, a summer music camp for teens, and intergenerational and outreach classes for under-served and geographically isolated populations. Director Pamela West-Finkle also teaches private and group instruction in voice, piano, guitar, woodwinds, brass, percussion, songwriting/composing, and ear training/theory. Programs currently open for registration include Music Together® Caregiver & Mixed-age Child (babies to age 7) classes in Hobart (Tuesday, Wednesday & Saturday) and Oneonta (Wednesday & Thursday). Groups or camps wishing to schedule a class at their own personal time and location are also welcome to contact West-Finkle. Classes begin July 6th and run until the beginning of August. The 2013 Summer Songwriting Camp will be held at the Hobart Activity Center from 9:00 am to 3:00 pm, Monday through Friday, August 4th – 8th. Teens and tweens, ages 10 to 17 who enjoy writing poetry and may sing and/or play an instrument are encouraged to attend. During the week, budding songwriters will get a chance to work with professionals to learn the elements of a good song, lyric writing, arranging, and producing a demo. Chord instruction on guitar and piano, and vocal coaching will also be available daily. The camp will also touch upon copyright and publishing and some songs will be recorded during camp. On Saturday, August 9th, there will be a showcase for those wishing to share their original creations with their families and the public. For more information on these programs, or to inquire about private instruction, contact Pamela West-Finkle at 607-652-2330 or FunMusic4Kids@aol.com. Forms and additional information is available at www.communitymusicnetwork.com and www.musictogether.com. The Community Music & Arts Network is offering free sample classes for the Fall 2013 Music Together® early childhood mixed age music and movement program. Parents and caregivers and children from birth to age seven are welcome to participate in this developmentally appropriate, research based, internationally acclaimed program. Demonstration classes will be held Wednesday, September 18th at 9:30 am in Hobart, at 4:30 pm in Oneonta, and again in Hobart at 10:15 am, Saturday, September 21st. Classes are currently held at the Hobart Activity Center, located at 8 Pine Street in Hobart, and the Foothills Performing Arts Center, located at 24 Market Street in Oneonta. In addition, there will be a free Intergenerational Class demo in the downstairs activity room of the Robynwood Assisted Living Center, located at the corner of Walnut and Maple in Oneonta, on Thursday, September 19th at 10:15 a.m. In this class, families come with children to participate with the elders. Pre-registration for these free classes is preferred to ensure space. Fall classes begin September 25thth and run through the first week of December. Registration is currently open and available online at www.communitymusicnetwork.com. Discounts are available for siblings and returning families. An infant sibling less than 8 months accompanying an older sibling is free. Registration includes two CDs for home and the car, parent education materials, and an activity songbook. In a Music Together class, twelve children and their parents or caregivers (nanny, babysitter, grandparent) meet for 45 minutes each week for ten weeks to experience new songs, chants, movement activities, and instrumental jam sessions. Both adults and children sit in the circle and participate, led by a teacher with early childhood and music skills. The teacher helps adults understand how to participate and the importance of relaxing and enjoying the activities with their children. Children have many opportunities to create and to play—making up rhythm patterns, making up new words to songs, and making up movements to express a sound. Some children simply stare and “study” the activity as they absorb the musically rich environment. Others sing, play, and dance freely because they know the songs and chants from the songbook and recording they take home. All experience a comfortable, encouraging environment that respects individual temperaments and learning styles. Twelve to fourteen activities are included in each class ranging from free movement to songs in unusual tonalities and unusual meters. Music Together is a music and movement approach to early childhood that develops every child’s opportunity for basic music competence by encouraging music experience rather than learning of information about music. Families are encouraged to attend class together, so younger children and older children in the same family can learn music and movement activities to enjoy at home. Parents also enjoy the classes because their skills and appreciation increase, too. In addition to the Music Together classes, the Community Music & Arts Network Center for Music and Creative Development has ongoing registration for their Early Childhood Arts Enrichment Program for preschool aged children (3 to 5) from 8:45 a.m. to 11:30 a.m., Monday through Friday. In this alternative preschool program, children will gain core learning through a Montessori and Waldorf-based approach to the integration of arts in the curriculum, providing daily music, imagination drawing, story, drama/theatre, yoga, dance, life skills, time in the library and in nature. The program can be used one or two days per week as a supplement to another program, or as a full five-day preschool, with tuition discounts based upon the number of days attending. For more information on Music Together®, visit www.musictogether.com. Free Sample Class for Music Together®, a research-based parent/child (birth to age 7) music enrichment program at the Hobart Activity Center, 8 Pine Street in Hobart 9:30 a.m. Wednesday, September 18th. Contact the Community Music & Arts Network director, Pamela West-Finkle, at 607-441-8448 or email FunMusic4Kids@aol.com to reserve a place in class. Visit www.communitymusicnetwork.com for more information. Registration is currently open for the Winter and Spring 2018 Music Together® ten-week song collections. Parents and caregivers and children from birth to age five are welcome to participate in this award-winning developmentally appropriate, research based, internationally acclaimed program. Licensed director, Pamela West-Finkle, is a certified K-12 Music Teacher and performing artist who has been teaching the Music Together program since 2002. The Winter session classes start Wednesday January 3rd at 5:30 pm at the Foothills Performing Arts and Civic Center, located at 24 Market Street, Oneonta. A Music Together Generations® class is available at 10:00 am starting Thursday, January 4th. Classes continue through the end of March, with the spring session starting immediately afterwards. For new families wishing to enter the program, free demonstrations will also be available throughout the session provided space is available. Pre-registration for these free classes is preferred to ensure space. Discounts are available for siblings and returning families. An infant sibling less than nine months accompanying an older sibling is free. Registration includes ten fun, interactive family music classes, CDs, digital downloads, parent education materials, access to a worldwide online forum of other Music Together® families, and a beautifully illustrated activity songbook to introduce music print awareness. There are nine total collections of music, each with over thirty new songs to learn. Children birth to age seven can attend the Music Together program for three years without repeating the same Fall, Winter, or Spring collection of music. Music Together’s primary belief is that all children are born musical and can develop basic music competency in early childhood via a developmentally appropriate full immersion setting that encourages hands-on music experience rather than learning of information about music. In a Music Together class, twelve children and their parents or caregivers (nanny, babysitter, grandparent) meet for 45 minutes each week for ten weeks to experience new songs, chants, movement activities, and instrumental jam sessions. Both adults and children sit in the circle and participate, led by a teacher with early childhood and music skills. The teacher helps adults understand how to participate and the importance of relaxing and enjoying the activities with their children. Besides the musical benefits, a recent national study conducted at Head Start in Bridgeport, Connecticut has shown that children who participate in Music Together® over the three years of rotating curriculum show significant gains compared to peers who have not received the program in the areas of cognitive, social/emotional, physical, and language development. In an age in which families are becoming more and more disconnected, Music Together offers a return to joyful family and community socialization through hands-on music making. For more information, to reserve a spot in a demonstration class, or to register for Music Together® classes, contact “Miss Pam” Pamela West-Finkle at 607-441-8448 or email FunMusic4Kids@aol.com. More information about programs and classes and registration forms are available on www.communitymusicnetwork.com. For more information on Music Together®, visit the national website at www.musictogether.com. After nearly a two-year hiatus, the Community Music and Arts Network has announced that it is starting up its Thursday morning inter-generational mixed age family music classes again at Robynwood Assisted Living Center, located at 43 Walnut Street in Oneonta. The classes will be held at 10:00 am in the downstairs activity and dining room. Children ages birth to seven and their parents, grandparents, or caregivers are invited to participate in the research-based, award-winning early childhood music and movement program Music Together®. Residents of the home form a human circle around the class, participating and interacting to the best of their mobility. The class was first introduced to the Robynwood community in 2012 by registered Music Together instructor and community music facilitator, Pamela West-Finkle; however, "Miss Pam," a certified New York State music teacher, had to give up the daytime inter-generational class to fill in long term for several area public school music programs. She is excited to return to Robynwood, as are the parents who have pooled together to bring back the class. Brianne Thompson, Robynwood's Live Enrichment Coordinator, posted on Facebook that the residents are also very excited about the return of the early childhood music program to the facility. In a Music Together class, everyone participates at whatever level they are able. Director “Miss Pam” leads the class through twelve to fourteen songs--singing, dancing, clapping hands, and playing percussion instruments-- naturally facilitating everyone’s ability to keep a beat and sing in tune in a developmentally appropriate environment. No prior musical skill or experience is necessary and the program offers three years and nearly 300 songs worth of non-repeating material. Much of the material consists of beautiful arrangements of traditional folk tunes, many of which the elderly residents are familiar with from their own childhoods. Pamela West-Finkle has conducted similar work with nursing homes and hospice since 1995, even performing with Musician's On Call in Manhattan for several years, providing bedside interactive performances for patients in hospitals across the five Burroughs. The Robynwood class, however, was her first inter-generational class after creating a proposal called "The Genesis Project," in which she felt strongly that the energy and interaction between the young children and the elders was something that was currently missing in today's family makeup, and interactive music was the best way to bring it back. Not only do the children achieve basic music competency (the ability to sing in tune and keep a beat), as well as the inherent cognitive, emotional, social, language, and physical development, the residents experience the therapeutic effects of the musical interaction as well. "In an ideal world," states Pamela West-Finkle,"I believe every nursing home or senior living center should have a preschool or daycare facility connected to it, and music should be part of the daily interaction between the two groups. I think our elders and our children would benefit tremendously from this kind of approach." In addition, families with special needs children and adults are also welcome to join the class. Part of the Community Music and Arts Network mission statement is to serve the under-served populations in the community, providing quality music programs to those who otherwise would not have access to these types of inclusive experiences. If you are interested in participating in this inter-generational class, visit www.communitymusicnetwork.com or contact Pamela West-Finkle at FunMusic4Kids@aol.com or 607-441-8448 to pre-register. Free trial classes are available, and other caregiver/child classes are currently held at the Foothills Performing Arts and Civic Center and will be starting soon at the Christ Episcopal Church in Cooperstown. For more information on this award-winning, international program, visit www.musictogether.com. The Community Music & Arts Network Center for Music and Creative Development is pleased to announce its plans to expand its programming this fall with an Early Childhood Arts Enrichment Program for ages three to five, Monday through Friday, 8:45 to 11:30 a.m. at the Hobart Activity Center in Hobart, NY. The program is based in Waldorf and Montessori philosophies, focusing on imagination play, building community, involving families, and educating the whole child. The Center believes that young children are filled with joy and enthusiasm. Participating wholeheartedly in everything around them, they learn naturally through imitation and imagination. Through structured play and teacher-modeling, the children will experience an assortment of developmentally appropriate arts activities designed to stimulate exploration and discovery and build self-esteem while enhancing their cognitive, language, physical, social, and emotional development. Children who are enrolled in the program will participate in creative drawing and painting, daily Music Together® music classes, theatrical and puppet play, storytime and storytelling, and social role playing in practical, meaningful situations. In addition, they will have yoga, meditation, special instrumental music instruction, snacks, time in the community library, gymnasium, and playground, and workshops with special guest artists and performers. With the cuts to public school arts education and reduced funding to subsidized preschools, The Community Music & Arts Network is stepping in to provide arts enrichment at the age when it may be most important. Director Pamela West-Finkle has teamed up with long-time friend and early childhood educator Zulema DeGregory of Stamford to provide this quality program that can be used by area families as either an arts supplement to preschool or daycare program, or a daily arts focused alternative to traditional preschool programs. Both DeGregory and West-Finkle have many years of teaching experience. “Miss Zee” has her Associates in Early Childhood Development Certification and has taught in preschools, after school programs, summer camps, and as a teachers aide and substitute in public schools for the last fifteen years. “Miss Pam” has a B.S. of Science in Education, a Masters in Music Education, a New York State Music teaching certification, and over fifty hours of early childhood music training from the Center for Music and Young Children in Princeton, NJ. Since 1996, she has taught music, English, creative writing, art, and worked as a professional teaching and performing artist. They are both parents of five children each and recent grandmothers, in addition to having taught hundreds of children in the local community. The Community Music & Arts Network is a community music center located in the Catskill Mountains of upstate New York, providing all ages music programs and musical outreach services to special needs populations and those residing in economically challenged and geographically isolated areas, as well as arts in education support for local school districts, home schooled, and preschool students. The Community Music & Arts Network is founded on the belief that access to music affords people the opportunity of a positive experience from which they may previously be excluded. This exclusion may be due to many factors, including a geographical location, economic or educational disadvantage, disability, age, or lack of any previous musical experience or exposure. Young children, senior citizens, disabled youth and adults, and emotionally troubled or at-risk teens are especially in need of the power of music to heal and make a difference in their daily lives, yet they are the ones most often excluded from opportunities to participate in musical activities. The Community Music & Arts Network is offering free sample classes for the Winter and Spring 2013 Music Together® early childhood mixed age music and movement program. Parents and caregivers and children from birth to age seven are welcome to participate in this award-winning developmentally appropriate, research based, internationally acclaimed program. Demonstration classes will be held at the Hobart Activity Center, between Pine and River Streets on Wednesday, December 12th at 9:15 am and on Saturday, December 15th at 10:15 am. Oneonta free demonstrations will be held Wednesday, December 12th at 4:30 pm in the Foothills Performing Arts Center, and Thursday, December 13th at 10:15 a.m., at the Robynwood Assisted Living Center on the Corner of Walnut and Maple. The Robynwood class is an intergenerational class, exposing the residents to the joyful musical interaction of the mixed age class. For new families wishing to enter the program, free demonstrations will also be available during the first two weeks of January. Pre-registration for these free classes is preferred to ensure space. The Winter session classes start Thursday, January 3rd and continue through the end of March, with the Spring session starting immediately afterwards. Discounts are available for siblings and returning families. An infant sibling less than 9 months accompanying an older sibling is free. Registration includes two CDs for home and the car, parent education materials, and an activity songbook. There are nine total collections of music, each with over thirty new songs to learn. Children birth to age seven can attend the Music Together program for three years without repeating the same Fall, Winter, or Spring collection of music. Besides the musical benefits, a recent national study conducted at Head Start in Bridgeport, Connecticut has shown that children who participate in Music Together® over the three years of rotating curriculum show significant gains compared to peers who have not received the program in the areas of cognitive, social/emotional, physical, and language development. For more information, to reserve a spot in a demonstration class, or to register for Music Together® classes, contact Pamela West-Finkle at 607-652-2330 or email FunMusic4Kids@aol.com. More information about programs and classes and registration forms are available on www.communitymusicnetwork.com. For more information on Music Together®, visit the national website at www.musictogether.com. Check calendar below for dates, times, and locations. The 4th Annual Community Music & Arts Network Summer Jam Camp came to a close on Friday, August 17th with a two-hour concert given by twenty-two Catskill Mountain teens at SEVA, the School for Environmental and Vocational Arts in South Kortright. Director and program developer, Pamela West-Finkle, began the event with a brief talk on the importance of the community music movement that began in countries like the UK and Australia, but is making its way in rural areas across America, providing all access music making to those living in economically challenged and geographically isolated areas. She also thanked the O’Connor Foundation for their generous support of the camp, Performance Plus of Stamford for their fiscal sponsorship, the SEVA Foundation and their community for hosting this year’s camp, and area businesses for providing scholarship donations. A total of six full and one partial scholarships were provided to area youth, ages 10 to 16. Business’ who provided support were The Community Music & Arts Network, Artisan Tile & Stone Company, Coldwell Banker Timberland Properties, Mark Birman of Tennis Everyone in Fleischmanns, Boyle Excavating, Stamford Farmers Cooperative, Ably Insurance, and TP’s Café in Stamford. Additional equipment for the camp was provided by Music Square of Oneonta, Bruce Kenyon’s Wired Heifer House Studios, Matt Woodin, and Theodore Finkle. The band Off Limits started the show, performing original alternative rock that they had written and recorded during the camp. Ed Newman of South Kortright Central School performed lead vocals and lead/rhythm guitar and was joined by three Stamford Central School students, Kevin Prior, also on lead vocals and guitar, KC Rockwell on bass, and Dominick Parker on drums. This was the 2nd year at the Jam Camp for all members of the band. Jefferson Piasek was their counselor/band mentor. Next, Splice took the stage performing “Rock and Roll Ain’t Noise Pollution” by AC/DC, “I Love Rock and Roll” by Joan Jett and the Blackhearts, and “Seven Nation Army” by the White Stripes, as well as an instrumental original written by guitarist/bassist Bobby Williams from South Kortright Central School, with arrangement help from counselor in training, Matthew Keating, a 2012 graduate of Stamford Central School. Also performing with Splice was Destiny Ray Falconio from Unatego Central School, who sang lead vocals and played the drums, Dakota Key from Charlotte Valley Central School on lead and rhythm guitar, and counselors AJ Pizcz on bass and Julian Nottage on drums. Light Purple was the third band to perform. The band rocked out on “Rock and Roll” by Led Zeppelin, “Smoke on the Water” by Deep Purple, and “Blue Letter” by Fleetwood Mac. The band featured two students from Roxbury Central School, Larissa Shultis on lead vocals and bass, and guitarist and drummer, Cass Kadow. Toby Harmon from Milford Central School played rhythm guitar and bass, and Lauren Whritner from South Kortright Central School played keyboards, bass, and sang the band’s original, “The Marsupial Song,” written by John Hultenius of Delaware Academy during week one of the camp. Matthew Curran, Julian Nottage, and Sean Degan were the rotating band counselors for this group. The final group consisted of a Glee-style vocal group called Vocally Inclined, under the direction of Pamela West-Finkle. Bill Wither’s “Lean on Me” featured vocalists Sam Breckenridge of the Woodstock Sudbury School and Anthony Ortiz from Stamford Central School. Poeu Breckenridge, also of the Woodstock Sudbury School, sang lead on Christina Perri’s “Jar of Hearts,” followed by the Jackson 5’s “I Want You Back,” featuring Jessica Alexander of Stamford Central School and Addison Harmon from Milford Central School, with Cora Van Kingsley of Sidney Schools on a trumpet part arranged by counselor in training and South Kortright Central School graduate Caleb Howland. The two-week day camp consisted of band formation, daily rehearsals, instruction on songwriting and arranging, master classes with guitarist Mike Herman and percussionists Marcel Smith and Theodore Finkle, and lessons on both a primary and a secondary instrument. The Community Music & Arts Network provides year-round all-ages, all-access music programming and is based out of the Hobart Activity Center, with additional early childhood and preschool music classes in Oneonta. For more information, contact Pamela West-Finkle at 607-652-2330, email FunMusic4Kids@aol.com, or visit www.communitymusicnetwork.com. Back Row, L-R: KC Rockwell, Sam Breckenridge, Dominick Parker, CIT Matt Keating, counselor Jefferson Piazek, counselor AJ Pizcz, counselor Julian Nottage, Larissa Schultis, Cass Kadow, Poeu Breckenridge, Bobby Williams, Ed Newman, Kevin Prior. Front Row, L-R: Khadyja Jalloh, Addison Harmon, Cora Van Kingsley, Anthony Ortiz, Jessica Alexander, Destiny Ray Falconio, Emma Sanzone, Lauren Whritner, Dakota Key, Toby Harmon. Not pictured: Isabelle Sears Surface, John Hultenius, counselor in training Caleb Howland, counselor Sean Degan, director Pamela West-Finkle.